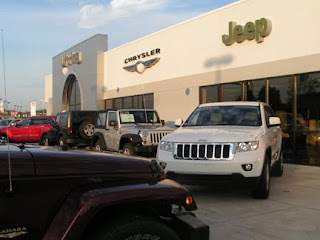 On September 22, Central Illinois Jeep enthusiasts were treated to an exclusive look at the long-anticipated 2011 Jeep Grand Cherokee and 2011 Jeep Wrangler at Uftring Chrysler Dodge Jeep in North Pekin. 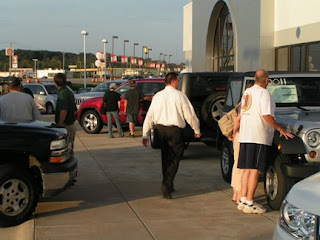 After months of buildup, numerous new Jeeps were on display from 6pm to 8pm both inside and outside the dealership. General Sales Manager Steve Porter and Sales Manager Don Twidell went to extra lengths to secure multiple models of both the new Grand Cherokee and Wrangler, including a sharp black 2011 4-door Wrangler that was parked right in the middle of the showroom floor. The reveal was part of Jeep's national "Celebration" event, aimed at drawing attention to the franchise's top two models for many years running. When an iconic vehicle like the Grand Cherokee receives a complete redesign, it's not small news. This 2011 has been rebuilt from the ground up and has been receiving rave reviews from both our staff and our customers. The 2011 Jeep Grand Cherokee boasts a brand new Pentastar V6 3.6-liter V6 engine that puts out 290 horsepower and 260 lb.-ft. of torque, plenty of power for your Peoria and Pekin area travels. The Grand Cherokee earns 23 miles per gallon on the highway with the Pentastar engine. A 360 horsepower Hemi V-8 Engine will also available if you really desire some extra hauling capabilities. This vehicle is loaded with the latest technology and it comes standard on every model. FloTV, satellite TV, satellite radio, and even an internet router for access to the world wide web on the go. The Jeep Grand Cherokee also has keyless entry, trailer sway control, stability control with anti-roll, power driver's seat, fog lamps, power adjusted heated mirrors, active head restraints, a leather wrapped steering wheel with audio controls, and hill start assist. The interior contains 17 percent more cargo space, and that's with the spare tire resting snugly on the inside. The rear seats enjoy 4 more inches of legroom than in the previous Grand Cherokee, so your kids and friends won't mind riding in the back on extended excursions outside of Peoria. The 2011 Jeep Wrangler, while not wrapped in wholesale changes, is different nonetheless. Changes include larger rear windows for increased visibility, a totally redesigned instrument panel and conveniences like steering wheel stereo control, bluetooth connectivity, USB input and additional sound-deadening material for a quieter cabin. There are also a few new paint colors to choose from, including Bright White, Cosmos Blue, Deep Cherry Red, Detonator Yellow and Sahara Tan. It was a beautiful day to see some new Jeeps! At Uftring Chrysler Dodge Jeep in North Pekin, we like Jeeps as much as our customers. 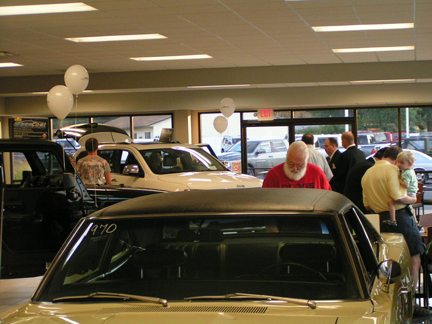 Our Reveal and Customer Orientation event was a chance for us to spend quality time getting to know our customers and hopefully providing them with information about their favorite Jeep vehicles. Attendees enjoyed catered food, refreshments, giveaways and raffle tickets and as many new details about the new Jeeps as we could possibly provide. Our team is currently undergoing product training on these new vehicles and there's no doubt about it - we're just as excited about them as everyone else. Stop by Uftring Chrysler Dodge Jeep in North Pekin today to test drive the all-new 2011 Jeep Grand Cherokee and 2011 Jeep Wrangler. We'll see you soon.